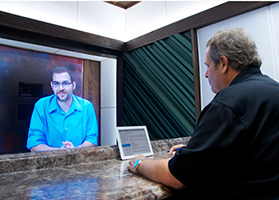 These systems feature the patented 3D Virtual TeleportationTM technology : the remote person seems physically present : life-sized, in 3D, with aligned eye-contact, no visible camera or screen. This is not comparable with 2D displays nor with ‘3D TV’s which require goggles. The 3D experience is without glasses and is authentic : the sense of presence is very strong. Most people think that the remote person is actually in the same room. All units can easily be connected with peripheral equipment (printer, scanner, reader,…). Note that in order to generate 3D images onto these units, an Agent Workstation for 3D transmission is required in the remote locations. 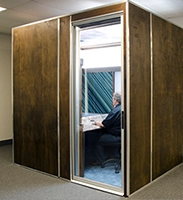 A self-contained unit with audio-isolated walls for maximum privacy. Hyper-realistic appearance of the remote person. Suitable for public location. Footprint is +/- 5 square meters.